Directions for Biscuits: Dissolve yeast in warm water in a small bowl; set aside. Whisk together flour, sugar, pumpkin-pie spice, baking powder, baking soda, and salt in a large bowl. Using a pastry blender or two knives, but the 1 stick cubed butter into the dry ingredients until butter pieces are the size of peas. Stir together pumpkin puree and buttermilk; add to the flour mixture along with the yeast mixture. Stir just until ingredients are moistened. Cover bowl with plastic wrap; refrigerate at least 1 hour or overnight. Preheat oven to 450° F . Coat two 9-inch-round cake pans with nonstick spray. Turn dough out onto a lightly floured surface. Knead dough lightly 4-5 times to incorporate the flour. Roll dough to a thickness of 1/2-inch. Cut dough with a 2-inch floured cutter to form 12 biscuits. Place biscuits in one of the prepared pans. Gather remaining dough scraps, then gently roll out dough again. Cut 12 more biscuits and place in second pan. Brush tops of biscuits with melted butter bake biscuits until lightly golden, 12-13 minutes. 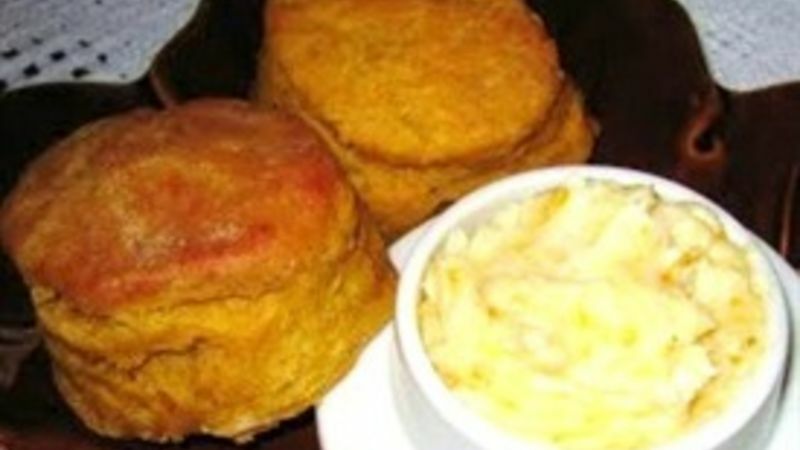 Turn biscuits out of pans and serve warm with Orange Honey Butter. Directions for Orange Honey Butter: Combine butter, honey, zest, and salt in a bowl. Scoop mixture onto a piece of plastic wrap; roil wrap around butter to form a long. Twist ends of plastic wrap tightly to seal. Chill log in the refrigerator until butter is firm. Store butter, sealed, up to 2 weeks in the refrigerator or freezer.